The moral of this story is that all ants are mean, don’t like to share and hate singing. Joking! 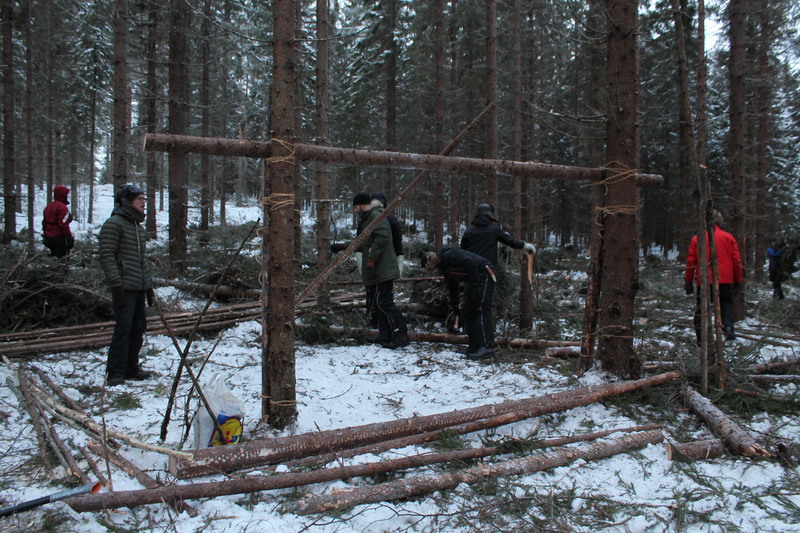 Mikko was enforcing that, in regard to shelter making you should act like the ant – take time to gather good quality materials and make the structure as best as you can in the first instant. Meaning you wont wake up in the middle of the night with your structure collapsed on top of you and rain slapping you in the face . 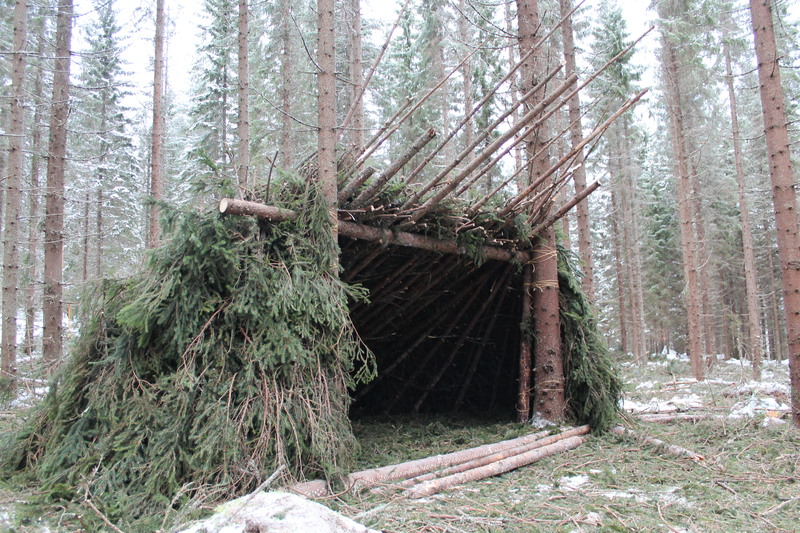 This kind of shelter is a substantial one and could sleep around 10 people. 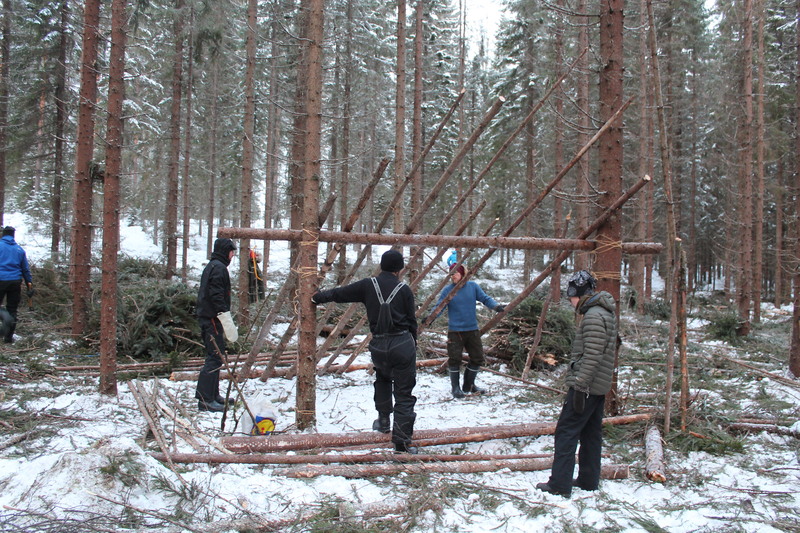 It is a luxury shelter and would have traditionally been made for people on hunting or logging expeditions. 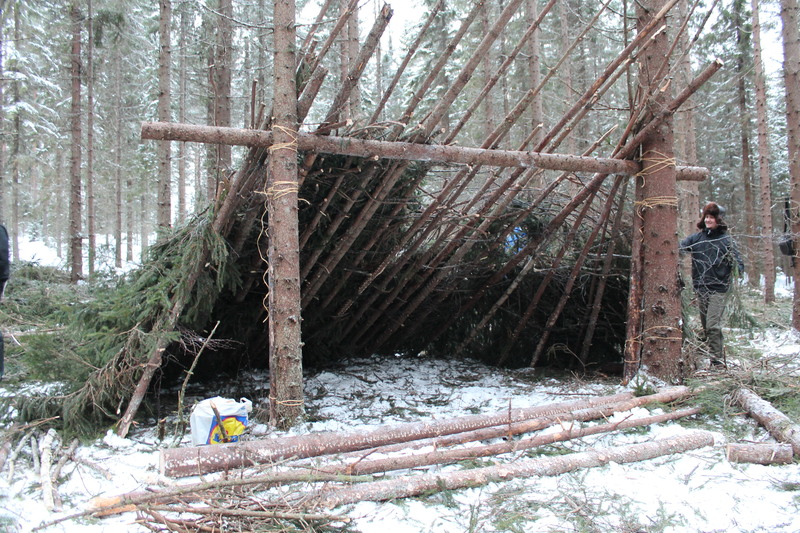 This took 12 of us 1.5hrs to build, and we were also in the wood where the forestry students practice, so there was an abundance of materials already felled. It was good fun and reminded me of messing around in the woods making dens when I were a wee lad. Find 2 trees about 5 metres apart, or however far you need to fit everyone in. Cut to length two 2m sections of wood about 10-15cm in diameter. Tie these with twine to the trees you have just found, ensuring they are on the other side of the shelter’s entrance. This helps structurally and will become clear from the photos. Then find a length of wood around 10cm or bigger in diameter to span this gap – the whole weight of the roof will rest on this branch so make sure it is strong and not rotten. Saw to length if needed. Chop any of the smaller branches off using the axe. Place this on top of the 2m long logs and tie to the trees with twine. Find around 15 wrist thick 4 – 6m lengths of wood. Again ensure they are not rotting, as these will form the roof. Place these onto the top of the ‘goal’ you have just made. Check the angle of the branches – they want to be steep enough to let the water drain off, but also need to be positioned in such a way that you can fit inside comfortably whilst lying down. These don’t need to be tied, just position a log at their base and peg it in place using some smaller lengths of wood. Firstly collect and gather many lengths of thin silver birch or willow. Then weave them in and out of the roof – this helps strengthen the structure, and also makes it easier to place the insulation and waterproof layer on. Gather as many leafy spruce and pine branches as possible. Start layering onto the structure around the bottom, make sure the tips of the branches are facing down the structure, then layer the branches up like roof tiles. This encourages the water to drain away more effectively. 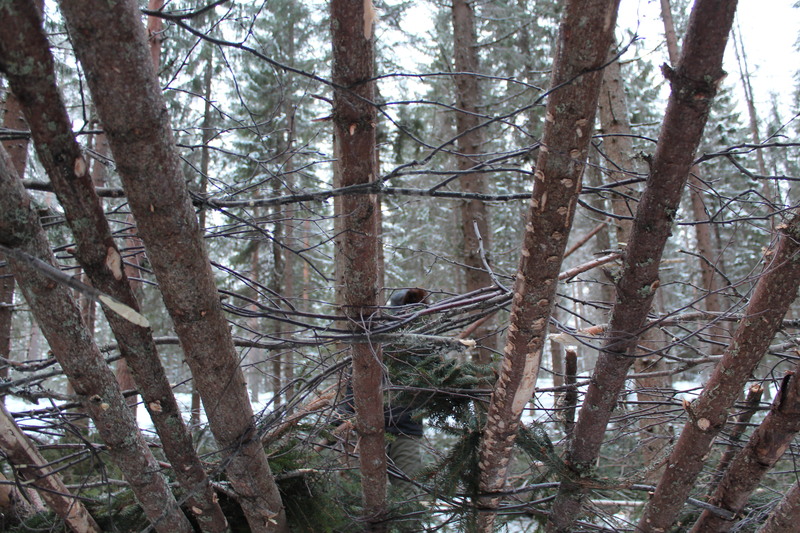 Cover the whole structure in roughly 30cm depth of branches. Get a couple of people inside to poke sticks out where they can see daylight, and cover the whole thing till no daylight can be seen from within. Again, this can seem to take a while, and it’s easy to just stop once it looks nice from the outside. But think like the aforementioned ant, and put the work in now. Collect even more leafy spruce and pine branches, and put them in a big pile outside the entrance. Get everyone to start snapping off the ends of the branches and throw them into the structure. You don’t want any sharp twiggy bits that might stick into your back in the night or puncture your equipment or clothing. Keep doing this untill you have about 50cm on the floor. This will help insulate you from the cold but will also act as a comfortable mattress to sleep on. And there you have it, a big, warm, and hopefully dry, shelter. 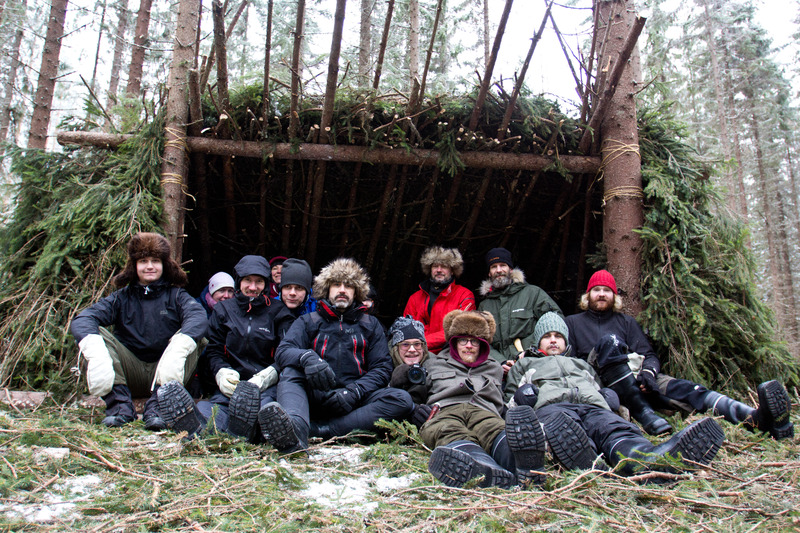 This entry was posted in Finland, How to's..., Traditional Skills, Wilderness Guide Training and tagged bushcraft, camping, Forests, nature, outdoor shelter, outdoors, pine, shelter, spruce, wild hut, woods by mountchris. Bookmark the permalink.